James was born about 1748 in Scotland most probably in Aberdeenshire, to as yet unknown parents. He was a Meal Miller at the Mill of Auchterellon. After his wife died James probably went to live with his daughter, Helen, who was in Overton/Overtown. He died at the age of 87 years on the 21st of June 1835 at Overton, Dudwick near Ellon in Aberdeenshire, Scotland. Elizabeth Watson was born about 1754, probably at Ellon, parents also unknown as yet. She died at the age of 74 years on the 19th of July 1828 at Cromley Bank near Ellon. 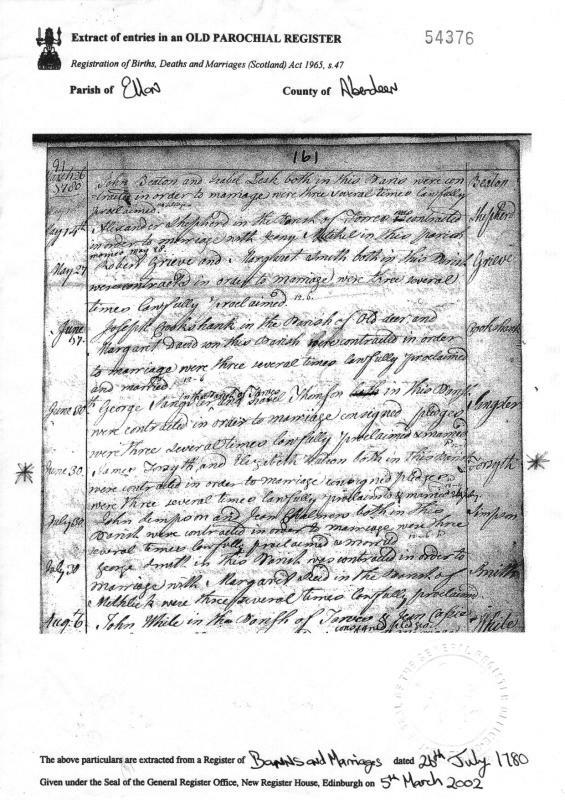 (From The registers of St. Mary-on-the-Rock Episcopal Chapel at Ellon, Diocese of Aberdeen & Orkney 1763-1871)From the following church records we learned that James and Elizabeth had 3 children that we know of. Helen Forsyth, daur to James & Elizabeth Watson in Mill of Auchterellon, bapt. 13 Jan 1781. James Forsyth, son to James & ........ in Mill of Auchterellon, bap 11 Jan 1783. Ann Forsyth no baptism found as yet. In the census' Ann gives her birthplace as Udny, Aberdeenshire. (A child belonging to ....... Forsyth at Mill of Auchter Ellon, another belonging to his brother at Little Mill of Esslemont ......... were forgot to be regularly inserted). "James Forsyth and Elizabeth Watson both in this Parish were contracted in order to marriage consigned pledged were then several times lawfully proclaimed as married 26 July"